On Saturday I traveled into the hills above Broughshane to catch up with local drift driver Mark McBurney of Team Driftshed, who at the age of just 24 has achieved something, that as far as we are aware, no one else has achieved in the Irish drift scene before now. Mark first got into drifting when his Brother Phil bought an iconic Toyota Corolla AE86 Coupe a few years ago and gave Mark a drive in it, from there Mark was hooked on rear wheel drive and set about finding something for himself to enjoy. 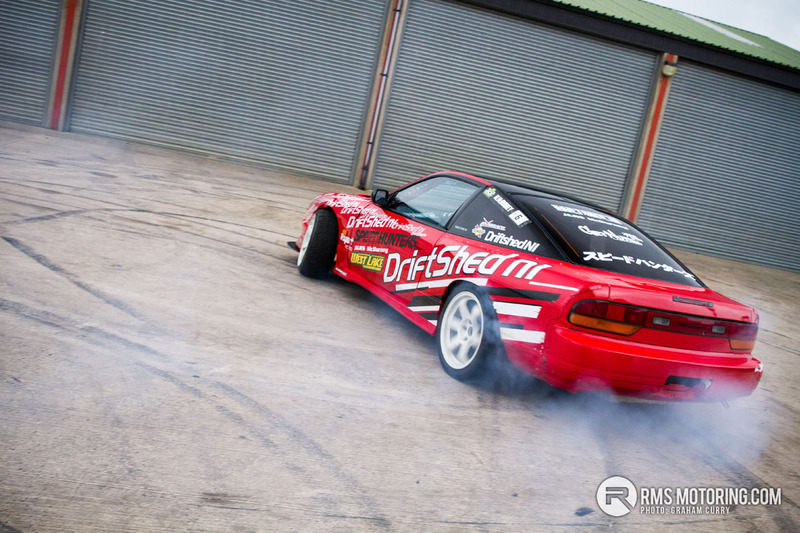 A Nissan 180sx was to be the chosen steed for a young McBurney and his foray into drifting started some four years ago with practice sessions held at a circuit in Aghadowey. This 180sx was white in colour, fully road legal and was driven to and from said events with I am sure the odd “moment” through a lack of talent at the start. After a year of getting to grips (or when it comes to the rear of the car, lack of grip) with the sport of drifting Mark took the decision to start competing and as such headed to the NI Drift series three years ago, which incorporated tracks at Bishopscourt and Eglington airfields as well as Tullyroan and Nutts Corner oval tracks. This was a great start for the young Co. Antrim lad as the opposition within this championship was pretty level in regards to experience of the drivers as well as the spec of cars so for Mark and #TeamDriftShedNI a sensible place to begin and get to grips with the adrenaline involved when in a judged battle. 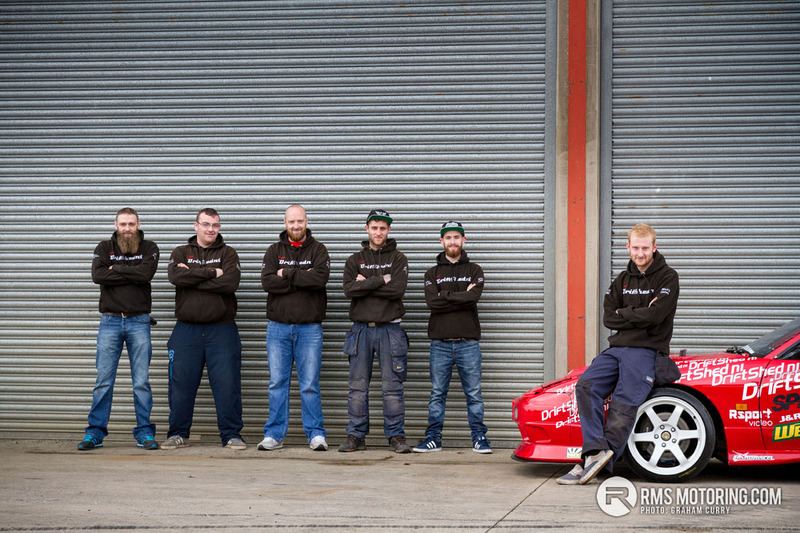 With no sporting background nor any previous motorsport driving Mark really threw himself in at the deep end and after a two year campaign in the NI Drift series after claiming Rookie of the year in 2014 followed by second overall in 2015 decided it was time to take his assault on success to the next level, to the Irish Drift Championship (IDC). I will go into the IDC later but for now it was time to give the trusty 180sx an overdue make over and mechanical overhaul before commencing battle once again so it was into the workshop where Mark and DriftShedNI fabrication partner Phil got to work. The Nissan 180sx was initially chosen, as in Mark’s words “The wee Japanese boys used them [for drifting], so they must work” and in fairness to him, they have a proven record within drift competition. 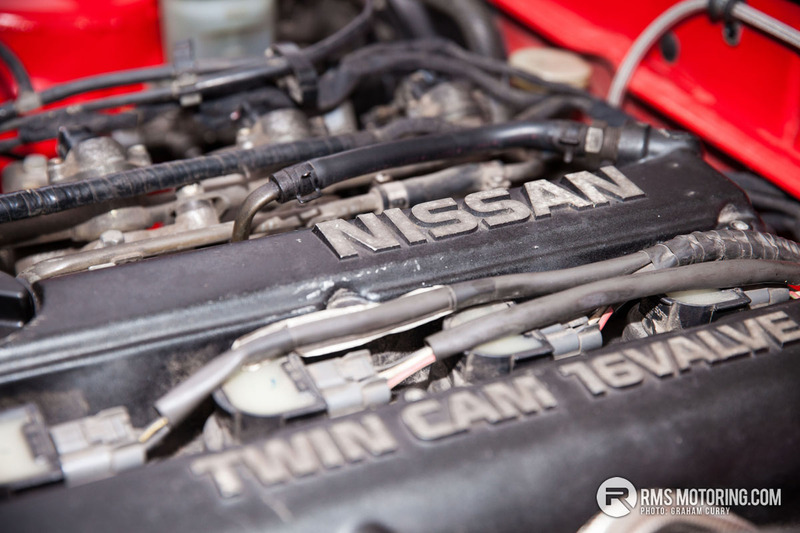 Anyway the car runs a Nissan SR20 2.0L turbo engine pushing around 400bhp due to the GT2871R turbocharger attached to a 6Boost manifold along with various other engine ancillaries such as cold air intake, front mounted alloy intercooler, alloy radiator, larger injectors and high pressure fuel pumps. An Apexi Power FC was fitted to control the engine management and once a lot of custom in-house fabrication was done around the engine bay, as well as the custom hand built fuel cell in the rear of the car, it was taken to TrackDay Performance to get mapped and set up. During this time the cars safety equipment such as bucket seat & harness, in house custom roll cage and all associated welded seams and joins were checked to be sure the car and equipment hadn’t sustained any damage during the odd rub with a tyre wall or fellow competitor over the previous two seasons. The chassis of the 180sx was always pretty good and to assist, the suspension was changed all round whilst a Wisefab steering angle kit was then fitted to allow the car more steering angle and as such has enabled McBurney to excite the crowds with his backwards entries which rack up valuable points with the judges. A change of colour and new livery was applied at this point and as per usual in motorsport, the car was finished with mere hours to spare before the first event in the IDC. The IDC is so big now, they actually have three classes of competition; Amateur, Semi-pro and Pro. As a newbie, it was clear that Mark was going to start off in the Amateur class which he hoped, at the end of the season, with enough strong finishes, would promote him into the Semi-Pro class for 2017 and as such the plan of turning Pro for 2018 could be achievable. However, it is not always that simple and with several dozens of others wanting to progress through the ranks to fight against some of the world’s best in the Pro category, it could take several seasons to make it that far. None the less McBurney and his band of merry men, known as #TeamDriftShedNI set off over that invisible line some call a border, several times in fact, attending several rounds in far far away places, to undertake what no man has done before. Zero to Hero in just one season. Mark arrived in the IDC as an unknown, a nobody, zero; as such all he carried was his name and number on the side window of the now rather stunning 180sx but what was to unfold during the season was rather quite special as he proved himself a force to be reckoned with. I mentioned a short time ago about progressing into Semi-Pro and with every amateur round, McBurney had the chance to experience Semi-Pro, under his amateur license status. This could be done with a top 4 finish in the Amateur round, allowing Mark out the next day in the Semi-Pro class to battle once again. During his Semi-Pro battle at Watergrasshill in Cork this year he even managed to take a top 4 spot which then allowed him to drive in the Pro category on the Sunday where he got on great until reliability issues raised their head and forced him out. During this weekend Mark had the drive of his career to date and indeed out of all the competitors managed to secure the “performance of the weekend” or “hero” award and bagged himself a new “Link ECU Management System” at the same time which will be fitted this winter. Now for Mark this wasn’t enough and rather than following the rule book and progressing into Semi-Pro for a full season before qualifying for Pro, Mark decided to keep driving the way he had and as such rewrote the rule book and gained his Pro license the same year that he attained his Amateur. Something which as far as we are aware has never happened in the IDC before as McBurney now skips the Semi-Pro class completely. On asking how this happened Mark replied with an excited smile “We just ******* did it” which was followed by laughter from #TeamDriftShedNI. I guess this is a great answer for many, though for the benefit of this article he continued to explain that with his top 4 finishes in Amateur, he took part in four of five Semi-Pro events, including podium finishes and via this he actually finished in the top 5 of the Semi-Pro class. Now this still doesn’t explain the gaining of the Pro license, so as I looked at him confused, Mark continued to explain that the top 5 drivers at the end of the season in the Semi-Pro class automatically gain promotion to the Pro class and as such history was made with him being in the top 5 of both Amateur and Semi-Pro progressing him to the top in just one season. Was at Japfest for the IDC Final a few weeks ago with @Karlos Da Jackle . Great performance from Mark and great bunch of guys answering my questions and letting look at the details on the car. Nice to see them getting some publicity! Great to see someone doing well with no huge financial backing that has appeared in drifting, blank chequebook material recently more so. | Great to see someone doing well with no huge financial backing that has appeared in drifting, blank chequebook material recently more so. Great group of hallions. Mark took me out a rip a good few years back in his 180sx. Holy crap, the man's an absolute pilot. | Great group of hallions. Mark took me out a rip a good few years back in his 180sx. Holy crap, the man's an absolute pilot. Fantastic result. I really must get down to IDC next season. Brilliant to see him doing so well, even seeing him competing in NI drift series a couple of years ago you knew he was someone to look out for. For anyone who hasn't went to IDC to watch, definitely get to at least one round at Mondello next year. It's UNREAL. | Fantastic result. I really must get down to IDC next season. The Drifting in Ireland has came on so much in the past few years and we now have some of the best drivers and Drift cars in the world If you are into cars and Motorsport then in my opinion you need to take the trip down and watch a round at Mondello. We have been to all the Mondello rounds this year and it never disappoints!! Well done to the Drift Shed team... Marks driving was top notch all year!